One of the interesting angles to the craft beverage boom around this area has been the collaborations that have popped up. Special brews for a shop and a coffee/vodka collaboration are among the examples. This collaborative cider comes in 12 oz cans and is made from a farmhouse blend of apples from Samascott Orchards fermented with Ommegang's proprietary house belgian yeast. The result is a belgian style cider with a smooth mouth feel and complex fruit and spiced notes. 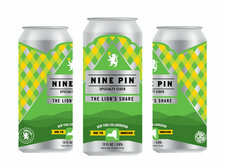 The Lion's Share was made in the spirit of the craft beverage revolution happening in New York! There's a Ciders and Sliders even this Thursday evening (August 4) from 4-9 pm to celebrate the release of 12-oz cans. The Slidin' Dirty truck will be at the cidery on Broadway serving food, and the Dutch Udder Craft Ice Cream will be there serving ice cream.